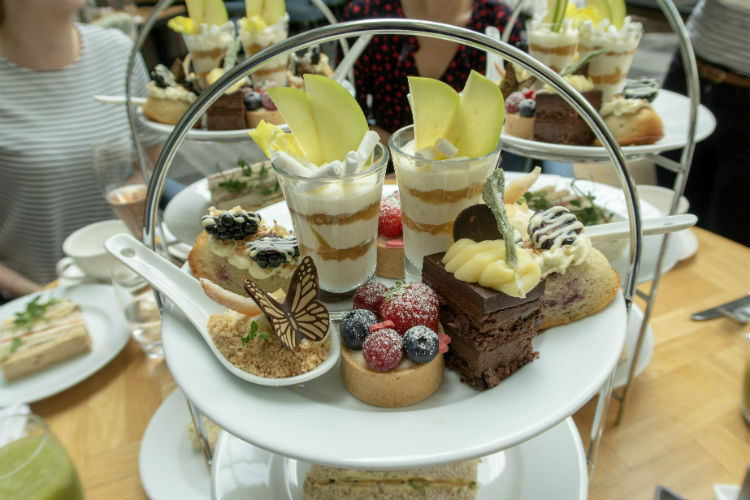 Afternoon tea at the Hyatt Regency Birmingham is a sight to behold! Amidst all of the hustle and bustle of modern living, it’s good to take time out to relax. And recently I was invited to experience a little pampering and relaxation in the heart of Birmingham. The Hyatt Regency Birmingham has long been one of my favourite hotels. It’s where Mark and I tend to book if we want to treat ourselves to a luxurious stay in the city. But until recently, I’d never visited the hotel’s spa. So I was thrilled when they invited me to join them for their first ever bloggers’ spa event. The Hyatt Regency Birmingham is located directly across from Centenary Square in the middle of Birmingham. It’s ideally placed for exploring the city, or for attending events at the Symphony Hall or Birmingham Repertory Theatre. I arrived at the hotel mid-morning and was taken downstairs from reception to the Amala Spa. Once through reception, I was taken into a tea room, where I was greeted with pastries and fruit juice while we waited for the other bloggers to arrive. With the dim lighting and gentle music, I started to feel relaxed almost immediately. After filling in the obligatory health and safety paperwork, I was taken through to one of the spa’s five treatment rooms for the first part of my day of relaxation. We had been offered the choice of either a manicure or pedicure, so I decided to take the opportunity to get my feet ready for summer sandals! I can sometimes feel a little squeamish about people touching my feet. But Sandy, my therapist, soon put me at ease and set to work making my feet look beautiful. Or as beautiful as my feet can look anyway! The Amala spa uses high quality ranges such as Orly, ESPA and Comfort Zone. I always think it’s reassuring to know that your skin is being pampered with good quality products. We chatted away as Sandy buffed and moisturised my feet, and prepared my nails for painting. The spa uses Orly polishes, and I had selected ‘Basket Case’ for my pedicure. It’s a bright pink that’s perfect for Spring and Summer. The treatment time seemed to fly by, and before long I was slipping on my sandals with lovely soft feet and pretty pink nails. So in love with my pretty pink toenails! I went back to the tea room to let my toes dry, and took the opportunity to look through the rest of the treatments offered at the Amala Spa. You can choose from several ESPA and Comfort Zone facials, classic and deluxe nail treatments or opt for a gel manicure. There is also a wide range of massages available, from Swedish and Deep Tissue massages, to Hot Stone and Aromatherapy massages. There’s even a massage that’s suitable for during pregnancy. But I’m really tempted by the Hammam rituals. These Turkish bath treatments take place in a private Hammam room, and are designed to deep cleanse and detox the skin. The Signature Royal Hammam is supplemented with royal jelly and argan oil – I definitely think I need to experience this soon! When my nails were dry, I was given a fluffy robe, towel and slippers, and it was time to head through to use the spa facilities. As there was no-one else in the changing room with me, I nipped around and took a few photos. The changing room was bright and airy, with lovely floral decorations. There are plenty of lockers, and they all have digital code locks so there’s no need to dig around in your purse for a pound coin! They also provide lovely Portico and Pharmacopia toiletries in travel size bottles, which I thought is a lovely touch. I quickly got changed and stashed my belongings in a locker, before heading through to the swimming pool. The pool area is very light and cheerful, with lots of loungers at the poolside and vintage prints along one wall.There is a steam room and a sauna, which was thankfully set at a good high temperature. And yes, there was a giant inflatable unicorn, but I didn’t try that out. I relaxed on the loungers, tried out the sauna, and carefully lowered myself into the icy plunge pool. That was refreshing, to say the least! After that, I decided to spend the rest of my time relaxing in the whirlpool. I was joined there by the other bloggers, who had all opted to have manicures. After chatting a while in the bubbles, it was time to get changed and ready for Afternoon Tea. The Aria restaurant in the Hyatt Regency Birmingham is set in the hotel’s atrium. The glass roof lets in masses of light, which makes it feel very open and natural. Combined with the light decor, large trees, and flowing water features, the restaurant has a very peaceful feeling about it. We were shown to our table, and found our places. The table was set with white china and pressed white napkins, which definitely got things off to a good start. Glasses of ice cold juice were soon brought out to us, and a bottle of Hattingley Valley Rosé was opened up. This is an English rosé sparkling wine with plenty of bubbles and a delicious flavour, with notes of redcurrants and strawberries. I haven’t tried many English wines before, but this one definitely impressed me. As did this gorgeous afternoon tea stand! It’s always a little hard to photograph a tea stand properly, because of the shadows that are cast on the lower plates. But I think you’ll agree that this one looks delicious! We had been asked for any dietary requirements in advance, and I was pleased to see that the vegetarian and vegan guests were well catered for. The hotel’s kitchen had even been able to deal with one guest’s specific allergy requirements. The sandwiches on an afternoon tea should be very easy to get right, yet so many places seem to fall short on this layer. These sandwiches were perfect. Soft, fresh bread cut into immaculate finger sandwiches, and filled with delicious treats like rare roast beef with horseradish and cream cheese with delicate slices of cucumber. This layer is possibly my favourite part of Afternoon Tea, and the Hyatt Regency Birmingham got it right again! Three dainty little scones per person – plain, fruit and lemon with poppyseed. They were soft and tender-crumbed, and slightly warm. The scones were served with little jars of strawberry jam, plenty of clotted cream and a home-made lemon curd. That looked so good, that I even I broke my own rule with the lemon and poppyseed scone. I spread the cream on first and then added a generous dollop of lemon curd on top. Yes, I was in heaven! Isn’t this the prettiest top tier that you’ve ever seen at an Afternoon Tea? The care and attention taken in creating these cakes and fancies is just amazing. And I can confirm that it all tasted as good as it looks. There’s a little blackberry, coconut and lime sponge filled with a whole blackberry, and a tartlet filled with creme pat and topped with juicy fresh berries. The morsel of chocolate delice was incredibly rich and decadent. And the little glasses are filled with a gin-spiked apple syllabub. It was so light that it melted away on my tongue, but that syllabub had a definite a kick! This was without doubt the best Afternoon Tea that I’ve ever had, and I’m already making plans for a return visit. My day at the Amala Spa was so wonderfully relaxing. When you are in the spa, you are cocooned from the hustle and bustle of the city centre. So it felt quite strange to walk out, blinking in the sunlight, at the end of the day. The experience that I enjoyed is along the lines of their City Escape package. This includes a 30 minute manicure, pedicure or facial, and use of the spa facilities, together with Afternoon Tea in the Aria restaurant. This package is available Monday-Thursday, subject to availability. Other packages are available including a luxury day for two, and a selection of Weekday Dual Treatments. Contact the Amala Spa on 0121 632 1690 to book or for further information. Thank you to the Hyatt Regency Birmingham for a wonderful day of relaxation. I can’t wait to go back! Oh that looks like a great afternoon to spend treating yourself. The hotel looks great and the tea very yummy! The top tier looks absolutely delicious, i love a good afternoon tea plus a spa in such a relaxing place is a bonus. The spa sounds so relaxing. I could do with a day there – especially if it involved Afternoon tea in the atrium after. It looks so instagram worthy! Oh man, I could really do with a spa day! This looks amazing and that afternoon tea is to die for. I haven’t been to a spa in such a long time but I really need to go soon. Seems like you had a wonderful and relaxing time!